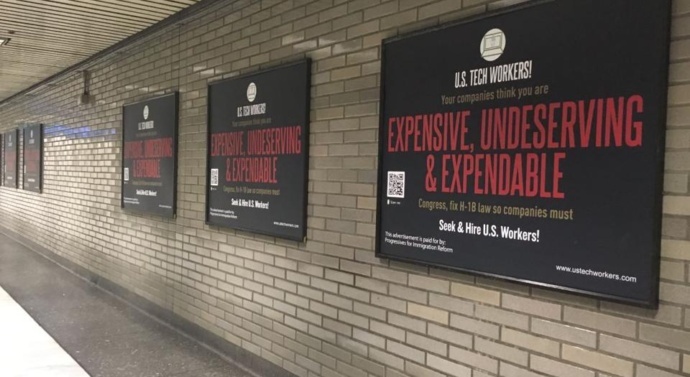 An organisation opposed to immigrants has put up anti-H-1B advertisements at railways stations and on trains around the San Francisco Bay Area in California, which is home to Silicon Valley — the hub of the world’s top IT companies. There was no mention of India or Indians in the ads, but being the largest recipients of H1-B visas, they are a known target of such campaigns. The San Francisco Bay Area — comprising the San Francisco and San Jose counties and houses Google, Facebook, Twitter and others — accounts for maximum H-1B visas given annually as a region, according to a Brookings study of 2013 data. The ads are receiving a lot of negative attention in a part of the United States that is among the most immigrant-friendly. “Awful, anti-immigrant ads in the BART station today. Where can I donate to support the exact opposite of this?” one man tweeted, sharing photos of the ad. BART itself seemed embarrassed and said in a statement it “does not endorse the ads” but it could not take them down as the “campaign complies with free speech laws that allow advertisers to express a point of view without regard to the viewpoint. BART must post these ads to comply with the law. Court rulings reinforce the fact that we can’t deny the ads”. The transit system has been paid $80,000 for the ads by the Progressives for Immigration Reforms, a Washington-based organisation that has been called anti-immigrant by the Southern Poverty Law Centre, a body that monitors hate-groups. Kevin Lynn, executive director of the group, denied the campaign had anything to do with the fact that most H-1B recipients are from India. “We wholeheartedly denounce the idea that we would discriminate against H-1B recipients. America has, and always will be, a land of many creeds and cultures. This is at its core, an issue of labour reform that we believe should be addressed,” he said. He added that the goal of the campaign was to organise American tech workers to “demand better protections from exploitation in the tech industry”. The ads tie into a bipartisan groundswell of opposition to H-1B visas that have been seen as being used to outsource American jobs. The Trump administration has initiated a series of measures to tighten rules and regulations regarding the processing of these visa, and in an attempt to make it less attractive, it plans to deny work authorization to spouses.